Many companies would love to be able to get the benefits of cloud--easy configurability, low cost, scaling, and more--but, due to various reasons, can't take advantage of public cloud services like Amazon. However, Metacloud (www.metacloud.com), a startup providing private cloud services, is looking to change the equation and make it much easier for companies to deploy their own private clouds. The company announced a funding round from Canaan Partners, Storm Ventures, and AME Cloud a couple of weeks ago. The Pasadena firm's co-founders, Sean Lynch and Steve Curry, sat down with us to talk about the service. Sean Lynch: What we do, in a nutshell, is provide private cloud as a service. In its simplest terms, we install OpenStack, plus two years of IP that we've developed here at MetaCloud, onto our client's server, at their data center. We build what appears to them as a public cloud-like experience, but it's on their server, on their premises, in their data center. People look at cloud as very two dimensional, public and private, but we dissect that into what we believe are four, core attributes. That is on premise, off premise, fully managed, and do-it-yourself. We think those four dimensions matter because you can sort of mix and match those, and end up with interesting business models. Amazon EC2 would be considered fully managed cloud, which also happens to be off premise. There is an advantage and disadvantage to that. The advantage is it is fully managed, and you have Amazon engineers and Amazon operations operating that cloud every day. The disadvantage is the liability because it's off premise to you. We wanted to take a step back, and look at the business model, and provide something on premise but fully managed. We have the best engineers in the world here at MetaCloud, the former cloud engineering team at Ticketmaster, which operates your cloud every day, deploys software updates, and gives you the economic performance of the cloud, but where you data is always under control and on your premises. That allows companies to reuse their existing capital, get full control over where their data resides, and where their performance is very deterministic, day in and day you, because you're not sharing it with any other tenant on the public cloud. We are also pushing out updates all the time to our customers. In fact, we just released a couple of updates, including adding Ceph, which lets users create storage by aggregating all of their commodity server disks. That's very powerful, if you think about. It displaces classic, Tier 1 storage, which you'd normally be getting from EMC or someone else. With our software, our clients just inherited the ability to use Ceph, and there was nothing they had to do to get that. They didn't have to play with software upgrades, and they didn't have to put together a contingency for rollback. They just have to pay us a modest amount on a recurring basis, and those features just appear. It's a very unique business model. What drove you to start MetaCloud? Steve Curry: I had been at Yahoo managing their storage operations. After I left Yahoo, I spent a couple of years with Forsythe Solutions Group, as a liaison with account executives. We spent lots of time with enterprises where technology was not their core product. They were in manufacturing, or a healthcare organization, and it was very obvious that most enterprises were struggling to run large scale infrastructure at scale, with efficiency. Typically, we saw very inefficient use of infrastructure in those enterprises. I got connected with Sean three or four years ago, and we started talking with we were seeing in the enterprise, and the things we knew in the organizations that we came from. That really sparked what Metacloud could be, what we could be, and what we could offer to the from enterprise. Sean Lynch: You've probably heard a lot of speculation about OpenStack's readiness for the enterprise. CIOs are wondering if they should jump in, wait for production, or wait for things to mature. We're mitigating all of those concerns and risks, and are accountable for the operations. We're signing SLAs with some teeth in it, and we're on the hook on how the private cloud operates. That allow enterprise CIOs to jump into OpenStack head first. 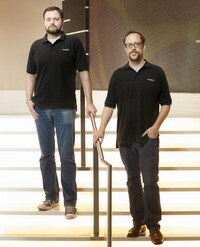 They've got one throat to choke, and Metacloud keeps things running day in and day out. Enterprise are quite constrained from the resource point of view, and they really don't have the cycles to understand OpenStack at a deep level. That will remain in-perpetuity. What we're saying, is for a fraction of the cost of building out your own, enterprise IT team, and in a world where your team is already underinvested and resources are scarce, let's take that on for you. Not only will it cost you less, you'll get a higher value. What is pushing those CIOs to consider private clouds? Sean Lynch: I think they're hunting for efficiency. Plus, another thing that OpenStack and the private cloud brings to the enterprise is the self service aspect of the cloud. An end user, the people who need those resources, can go to those resources and provision them in second or minutes, and have exactly what they need in one simple transaction. IN the past, that would have meant sending emails, giving a call to IT, articulating what you need, and eventually your ticket might get closed down in a week or a month. We're driving up the efficiency in both the infrastructure and across a team. Steve Curry: The promise of solutions like VMware, is they address utilization of existing capital and servers. That worked, to some degree. Bare metal installations have utilization of around 10 to 15 percent. When you move to a solution like VMware, it drives up utilization per server to something like 30 to 40 percent. But, in a Metacloud environment--and having to do more with OpenStack than Metacloud--is you end up with a much richer, multitenancy, versus VMware. You can really oversubscribe that capital investment, and drive up utilization to something really meaningful, like 80 to 85 percent utilization. That's what we're seeing. I know the industry tends to talk about hybrid cloud and the benefits there. But, we said, it's not worth the duplicity, because there's already so much untapped capability in the big enterprise. They just need to use what they have, more efficiently. What types of applications are those enterprises running on the cloud? Sean Lynch: It's actually a traditional workload. Companies aren't really in a rush to rewrite applications to be more cloud friendly. One of our customers has 6,500 separate and distinct applications. They're a Fortune 50 company, and they just don't want to have to rewrite all that stuff. But, they don't want to defer the promise of cloud to rewrite those apps. They're just virtualizing everything they have. We notice there are quite a few open source companies, like yourself, here in Southern California, and in the Los Angeles area. Why do you imagine that's the case? Sean Lynch: Open source demands a very low level, engineering talent pool. You really need the best and brightest to deal with open source. Open source software really has a better feature set and is more technically advanced than commercial offerings. If you're talking pure, open source software to pure, commercial software, it's indisputable that open source is far more technical and less refined for consumption. Because that's the case, it really demand more low level engineers. There's more engineering talent in Southern California than most places in the world. I think the numbers say we're producing ten times the number of engineers in Southern California relative to Northern California. I think that, because of that, we have a rich population of engineering talent in SoCal, people who can actually take that open source software challenge and deal with it in a meaningful way. Why is it that enterprises are so open to trying open source nowadays? Steve Curry: There's fatigue around paying for proprietary solutions. There's a big drive to help get the enterprise away from that, and towards open solutions. A good example of that is Ceph. You can use a commodity server, fill it with disks, and have reliant, redundant storage offering for the enterprise. But, you're not paying an enormous overhead for branded storage offerings. You have a very powerful solution, backed by commodity hardware, yet it's very open. There's a big drive from the enterprise and from CIOs to break away from that proprietary death grip that legacy companies have on the enterprise. Sean Lynch: We just released our next major release of CarbonOS, which we're very excited about. That lets us introduce Metacloud into large scale storage in a meaningful way. Storage is 80 percent of the enterprise IT budget, and it's a real challenge. We've had a number of CIOs come back to us, tell us they love the product, because they can stop buying an expensive, dedicated commercial appliance. We're now rolling it out, and the next thing is full global deployment of CarbonOS across our full client base. We're really excited to see the storage platform grow pretty substantially. We're excited to be able to see the data, analyze it, and see that we're making a meaningful impact to enterprise data center economics through this new storage offering. Our focus right now is refining that offering, and continuing to onboard more clients. Metacloud VC On Cisco Acquisition: "Epic Exit"